It’s that time of year when I declare I’ll abandon my strictly orthodox digging and sifting of all new ground, in the interests of actually planting something. I’ve followed through with this once before, under the Munty frame. Looking at it now, it’s fairly noticeable that ALL the weeds have come back, and this year they’ve brought friends. Whereas the sifted & dug beds are quietly clear with only a few optimistic invaders on the borders. However, needs must. I have a small population of squashes clamouring to be out of their pots. The space I had clear now houses some actual parsnips! 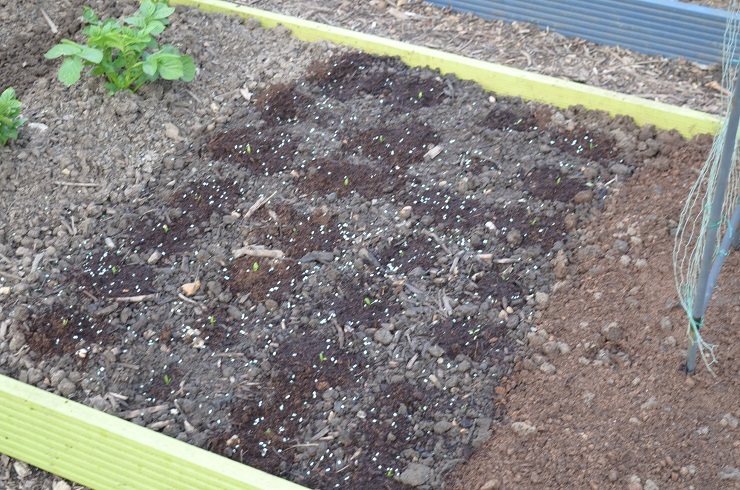 They are the most faffed over seeds this year: chitted, carefully sown into loo rolls and then planted in 28 carefully dibbed holes out near the Dunluce spuds when the seed leaves showed. At that point the taproot is already 2-3 inches long. If I’d waited for the true leaves to show the root would have been out of the bottom and the ‘snips would have forked. Hopefully slugs will leave me enough for Christmas dinner…nematodes are on order. I’ve planted up one side of the greenhouse with tomatoes and aubergines – if the weather would just improve a bit then I’d see some growth. They’ve all stalled a bit. Thankfully I remembered last year’s jungle and this year they are planted further back from the path. 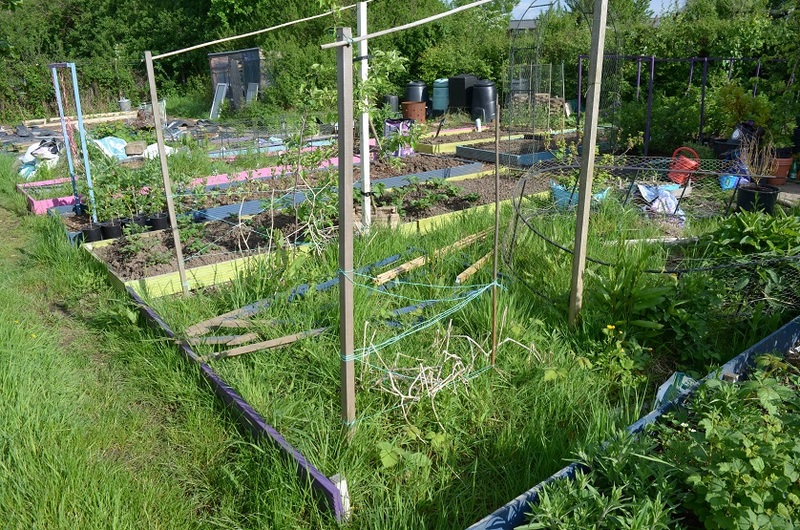 I’m using twine to hold them up again – the plants sit on the end of the twine so their roots anchor it into place and the stems are wound around as they grow up. It’s so much easier than tying onto stakes. The top of the twine is half-hitched to a horizontal bamboo so I can lengthen it if needed. My chillies are in desperate need of potting on. The compost in their pots must be exhausted and they are still tiny little things. I must find some time to sort them out. Kent Blue peas are romping away now. It’s going to be a wrench to pull them out to make room for more tomatoes. 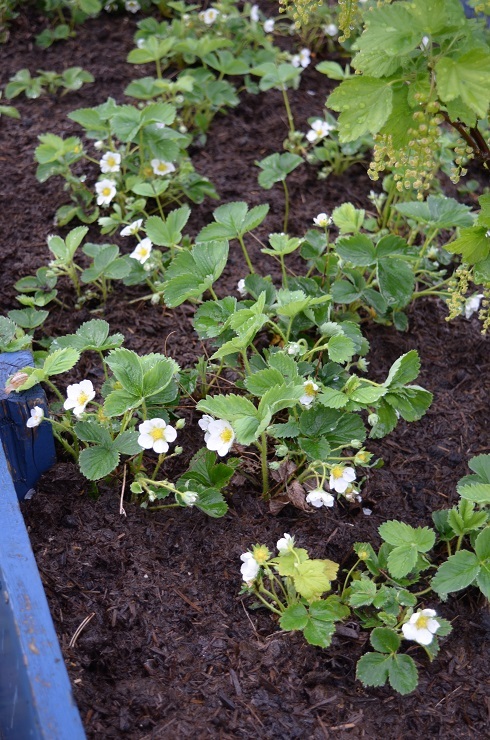 As per my task list, I’ve fixed the strawberries in the top bed. No longer are they sharing space with docks, green alkanet, brambles and clumps of tufty grass. I’ve left the nigella though, that’s pretty. By the looks of things last year’s awful strawberry harvest is long forgotten. 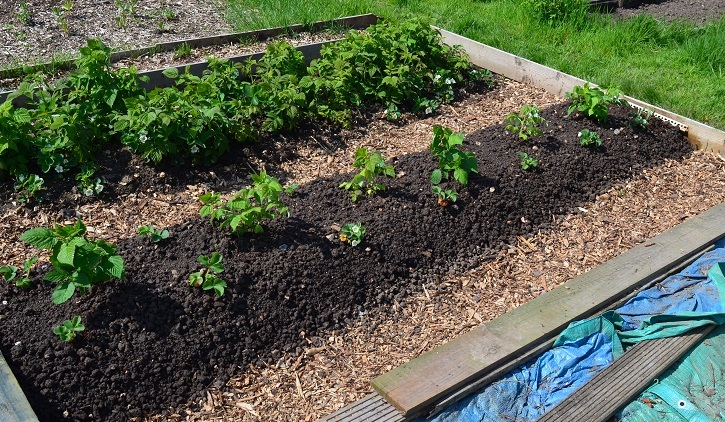 I’ve mulched them with composted stable manure to try and keep the soil below moist, and will see if I can lay my hands on more spent hops so the berries don’t ripen whilst nestled in a bed of poo. It’s that or straw. My nets go on tomorrow, after an adjustment has been made to the leaning tower of Jonkheer van Tets. 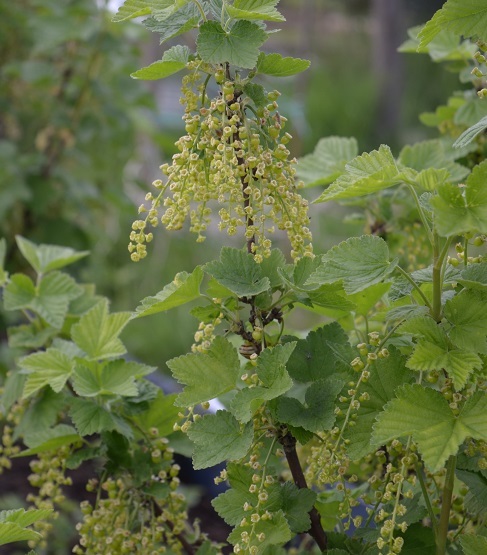 I planted the redcurrant unwisely, and it has a severe list that is only going to be corrected by uprooting and setting straight. For now I plan on bodging a brace to pull it away from the net, using wires threaded through some insulation tubing and a bit of spare post. The new raspberry bed has taken well. Missing from the photo here is that the lovely berries are sharing space with turnips. Not quite in keeping with a fruit area, but they fitted in so neatly! I’ve also found a wee error in my planting…my magnolia blossom tendril peas are plonked on top of 2 of the Charlottes. Any idea how well spuds and peas coexist? The saffron has now almost completely died back, ready for digging up in a month or so and thinning out. I grow on the smallest corms in big pots; they won’t flower till they are bigger and this keeps them nicely separated. All the pots get amalgamated when those corms are dormant, and left in a shady space till I need to plant the biggest corms out again. 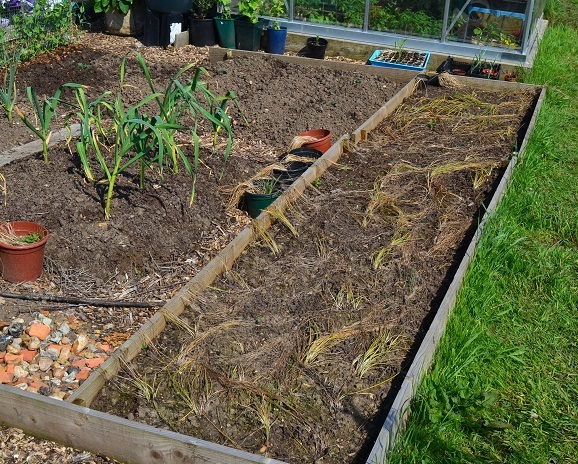 I’ve given some away already this year – it’s amazing to think I started out with 60 corms in 2014 and now I bet I have well over 400. And ending back with the theme of heresy, or at least crimes against preserves, some chainsaw-happy Council employee has brutalised my favourite stash of elders. Probably in the interests of neatness. So the weekend before last also included a bike ride around other top foraging spots to check whether elderberry jelly can still be on the menu this year. The blossom’s nearly all out so cordial could be on the cards too. OK got to know was the parsnips the ones I sent you, and you actually managed to chit them? Details of how you did it and how long it took if you can as I have not sown mine yet.